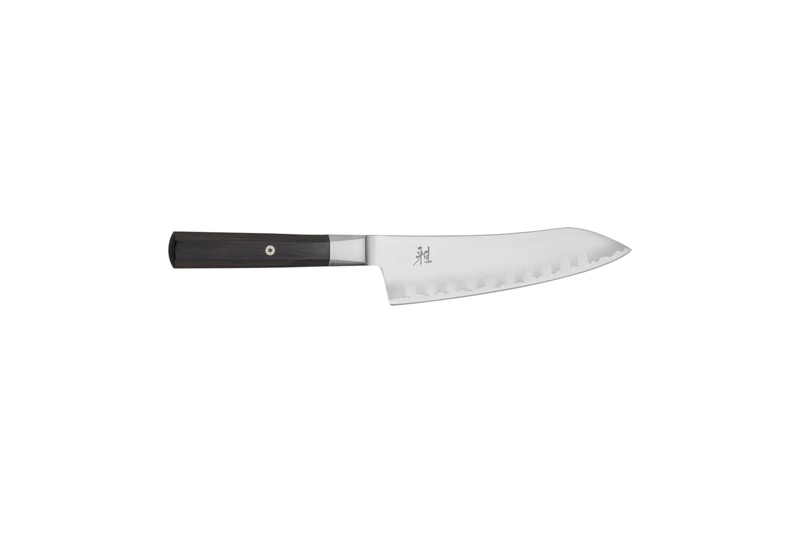 Beautifully polished to a mirror finish, the ice-hardened blade of the Miyabi Koh 7 inch Rocking Santoku is extremely durable and corrosion resistant. Made from revolutionary fine carbide FC61 steel, this knife offers the signature sharpness for which Japanese knives are known. The ergonomic, triple-rivet Pakkawood handle encourages fatigue-free cutting and supports both Western chopping and Asian rocking cuts. With their utmost attention to detail, skilled artisans ensure each Miyabi Koh knife is of the finest caliber. Time-tested German engineering meets Japanese craftsmanship. Hand-honed Honbazuke blade boasts 12° angle, for scalpel-like sharpness. Ergonomic, triple-riveted Pakkawood handle nestles comfortably in the hand. Rocking Santoku: 7 inch blade, 12 inch overall length.